Irish placemats feature a lace shamrock design. 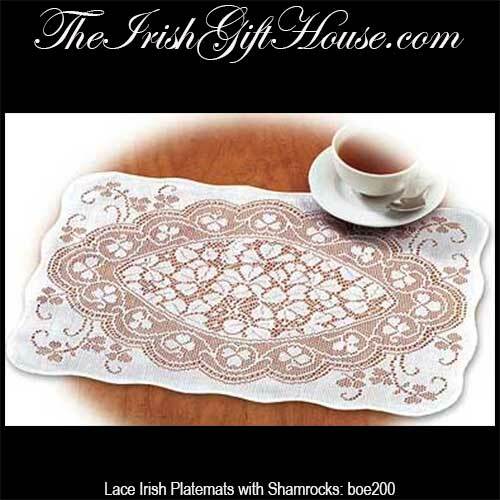 Please note that these shamrock lace placemats are imported. These shamrock placemats feature a lace design that will grace any Irish table. The set of four Irish placemats with shamrocks are 100% polyester and measure 18” wide x 13” tall. This Irish table linen is received with a shamrock history card that, complements of The Irish Gift House. Irish placemats are reversible and feature a shamrock design on both sides of the four placemats in the set. Irish napkin squares are cloth design that feature a shamrock motif on both sides.